Heading This Way Just north of the peninsula containing Viet Nam, Laos and Cambodia, the satellite image shows a brown swath of dust and particles from southeast China sweeping across the Pacific Ocean, heading toward North America. The PNNL study found that these well-traveled dust, sulfate, and nitrate particles make up a significant portion of the concentrations found over the western US. Image is courtesy of NASA. Enlarge Image. Results: How do you test a model simulator? Compare it to real life. That's what scientists at Pacific Northwest National Laboratory did when they compared several observational sets with a simulation of how tiny atmospheric particles travel and age over the Pacific Ocean. They found that particles of dust, sulfate, and nitrate traveling across the Pacific make up a significant portion of the concentrations found over the rural Western United States. However, peaks of carbon-containing aerosol particles are largely dominated by home grown emissions. In most respects, the simulation compares well with satellite and land-based observations for how light passes through or is absorbed by the particles, their sizes and distributions, and the seasonal variability of their movement. "Where the model fell short was on estimating carbon-containing particles," said lead researcher Dr. Chun Zhao, PNNL atmospheric scientist. "This is likely due to the 'wild cards' of emissions from biomass burning, such as forest fires and field burn-off, and production of so-called 'secondary' aerosols—the ones that form in the atmosphere post-emission." 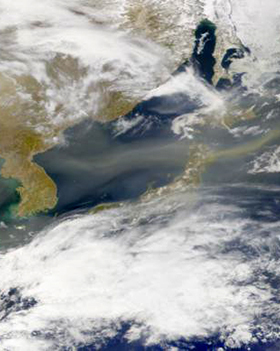 Why It Matters: Dust and pollutants emanating from Asia and Africa, combined with particles tossed into the mix from ocean spray, surf the atmospheric waves. Along the way, they interfere with sunlight beaming to Earth and cloud-making. The researchers sought to quantify the ability of climate models to simulate trans-Pacific aerosol transport which is an important step toward understanding its impacts on regional climate and air quality in western North America. Methods: The research team, led by PNNL, used the Weather Research and Forecasting model coupled with chemistry (WRF-Chem) to conduct quasi-global simulation for 2010-2014 to study trans-Pacific transport of aerosols and their impacts on clouds and precipitation in California. For the first time, they evaluated the simulation of meteorological fields and aerosol properties by using multiple observation and reanalysis datasets. Their evaluation focused on the simulation over the trans-Pacific transport region. The simulations generally captured the spatial and seasonal variability of satellite-retrieved aerosol optical depth (AOD) and absorbing AOD over the Pacific Ocean. These are determined by the outflow of pollutants and dust from Asia and Africa and the emissions of marine aerosol particles (sea spray) from the ocean. The model also reproduced the variability of particle size distributions and the vertical profile of aerosol extinction (how it is removed) and its seasonality over the Pacific. They found that the model has biases in estimating marine aerosol emissions and uncertainties in the satellite sampling and retrieval which contribute to the differences between the simulation and satellite observations. Compared with surface measurements over the western United States, the model also reasonably simulates the observed dust, sulfate, and nitrate surface concentrations. However, significant underestimation of the peak surface concentrations of carbonaceous aerosol is noticeable, which is likely due to model biases in biomass burning emissions and secondary organic aerosol production. Their sensitivity simulation showed that the trans-Pacific transported dust, sulfate, and nitrate makes a significant contribution to surface concentrations over the rural areas of the western United States, but peaks of carbonaceous (carbon-containing) aerosol surface concentrations were dominated by emissions from North America. What's Next? The WRF-Chem quasi-global simulation will be used to understand inflow chemical boundaries over the western United States. This will help understand the impact of transported pollutants on the regional air quality and climate using high-resolution, nested regional modeling. Sponsors: This research was supported by the U.S. Department of Energy (DOE) Office of Science as part of the Regional & Global Climate Modeling Program. Partial support was also provided by the National Basic Research Program of China and the NASA CALIPSO project. Facility: Simulations were performed using PNNL Institutional Computing. Research Team: Zhiyuan Hu, Chun Zhao, L. Ruby Leung, and Yun Qian, PNNL; Jianping Huang, Lanzhou University, China; Hongbin Yu, University of Maryland and NASA Goddard Space Flight Center; and Lei Huang and Olga V. Kalashnikova, Jet Propulsion Laboratory at the California Institute of Technology and NASA. 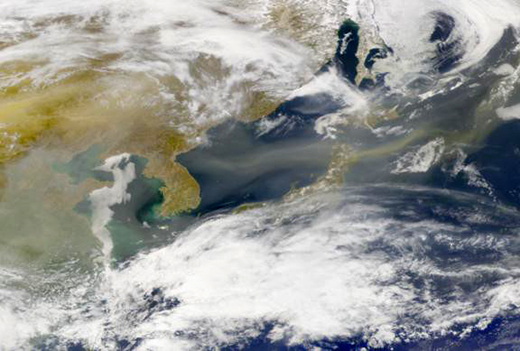 In one sentence: PNNL scientists found that dust, sulfate, and nitrate atmospheric particles crossing the Pacific from China are a significant portion of the concentrations over rural Western United States, though soot particles are home grown.